I have spent more time in Scranton than I really wanted to because one of my company’s divisions is located there. 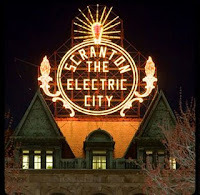 Scranton has recently been made famous by “The Office” and Hilary’s recent rediscovery of her NEPA roots. My company is located in the building made famous by The Office and has a name that is suspiciously similar. Local rumor has it that there are employees leaking tidbits of information that turn up in story lines, and indeed the few times I tuned in, I recognized a few. I wish the real building were as nice as the one depicted on TV. The reality is that the building environment is a challenge to its occupants, ranging from persistent roof leaks and flooding (one morning I walked into Creative to see that they had sensibly positioned umbrellas over their PC’s to ward off the steady drip of water) to an almost complete lack of climate control. I am on the divisional distribution list and, as I sit comfortably in one of our other divisions, regularly see the broadcast emails that proclaim that the air- conditioning should be repaired shortly (after a week in the high 80’s) and in the mean time, HR has purchased portable air conditioners and positioned them strategically around the building. Unfortunately they forgot that these have to be vented , so someone’s office had to be selected as the recipient of the hot air. A couple of years ago after the heat had still not appeared by late November, the company discovered that when the city of Scranton discontinued the hot steam heating that it provided to the city, the landlord had neglected to provide an alternative. Northeastern PA is located in the Pocono mountains and is not exactly balmy in the winter. The first winter I worked for the company I was stuck there for 2 weeks in January and the outside temperature didn’t break 12 degrees. So now you have the inside scoop.